(16/46) TRENTON – As much as the nation has seen over the centuries – peace, conflict, prosperity, social change, expansion, the pain of terrorism – one thing has remained constant:. The American flag continues to stand as the world’s symbol of hope and freedom. With Memorial Day and Flag Day approaching, the Department of Environmental Protection’s State Park Service and the Twin Lights Historical Society invite residents to visit the Twin Lights of the Navesink in Highlands, Monmouth County, to soak in the “Seeing Stars: Every Flag Tells a Story” exhibit, a stunning and inspirational celebration of the evolution of the Stars and Stripes. 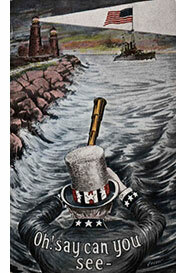 The exhibit is now on display at Twin Lights Historic Site, known as the birthplace of the Pledge of Allegiance. 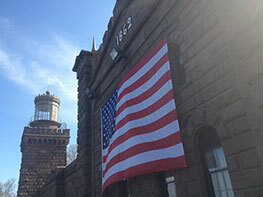 In 1893, the first official reading of the Pledge of Allegiance took place at the Twin Lights of the Navesink around a 135-foot flag pole, known as the Liberty Pole, which was among the first sights millions of immigrants saw as they steamed toward Ellis Island and a new start in America. The reciting of the pledge was led by its author, Francis Bellamy, who wrote it for schoolchildren to recite during a Columbus Day ceremony in 1892. “This exhibit, which chronicles the changes in the flag through key periods in our history, and how the Stars and Bars graced everything from political paraphernalia to wartime posters and patriotic paintings, is a must-see for anyone who loves this country and what it stands for,” said Mark Texel, Director of the DEP’s Division of Parks and Forestry. The exhibit, which took three years to create and opened last fall, chronicles the development of the flag and how it has changed through the nation’s expansion over the centuries. The Historical Society recently produced a 40-minute film on the Pledge entitled You Heard It Here First, narrated by actor Ed Asner, which won the 2016 Garden State Film Festival award for Best Short Documentary. Among the treasures on display are Jamie Wyeth’s original painting “Ground Zero,” a tribute to the victims, survivors and heroes of the September 11, 2001 terrorist attacks on the World Trade Center. It also includes and original of Frederic Church’s “Our Banner in the Sky,” painted in the early days of the Civil War as a reflection of his grief over the dividing of the nation. Twin Lights, a brownstone structure standing atop the Navesink Highlands and commanding a sweeping view of Sandy Hook, Raritan Bay and the Atlantic, was completed in 1862 to guide ships into New York Harbor. Replacing earlier light stations, it was considered the best and brightest lighthouse in North America for generations of seafarers. In 1898, electric lamps were placed in the south tower, making this one of the first electrically powered lighthouses in the nation. Today, Twin Lights Historic Site houses a stellar museum about the lighthouse, lighthouse technology, piloting and navigation, and the U.S. Lifesaving Service. The lighthouse tower, museum, gift shop, and other buildings are open Wednesday through Sunday, 10 a.m. to noon and from 1 p.m. to 4 p.m. The grounds are open 9 a.m. to 4:30 p.m. Please call (732) 872-1814 for specific information as hours may vary.